These Ladies Gold Plated Coronet Prince of Wales Spurs with Box are made of only exceptional quality materials. When buying a pair of Ladies Boot Spurs from us rest assured you are getting a great product at unbeatable pricing. This pair of spurs are gold plated and are luxury boot spurs which also come with a box to keep them safe. They are a very luxurious set of women spurs to show off to your friends and stand out from the rest. 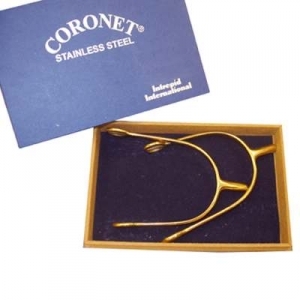 These beautiful spurs are presented in a lovely coronet box. 3/4'' Neck.